It also turns out that a Real-Stripe matrix also takes up more space per pixel. This explains why a 4.3" display that uses Real-Stripe has the same resolution as a 4" with a penTile matrix. But this display should actually be clearer because of the added sub-pixels and better matrix design. One final bit of good news - according to Samsung, Super AMOLED Plus displays are not only clearer but they're also thinner, brighter and use 18% less energy than the old Super AMOLED displays! is that what was throwing you off? Super AMOLED Plus resolution mystery? 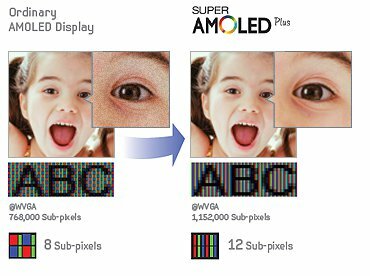 Super AMOLED HD to use PenTile technology?